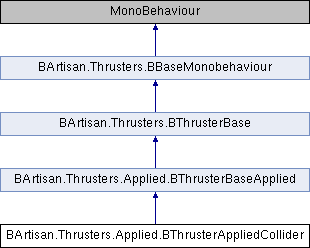 While the "regular" thrusters move only a specific GameObject, the Applied thrusters move all the objects, except the attached one. The force is added each Physics frame (FixedUpdate) while all the conditions are met. It works with all GO that have a Collider and a Rigidbody, are in a specific layer (affectedOnlyLayer) and are located in a sphere of "radius" units (surrounding this GO). The Sphere radius (affected zone) is drawed in Scene editor also, for debuging purposes. The vector force is drawed in Scene editor with a red line (when is applied). The thruster is built for 3D environments (it uses Rigidbody and Collider components). This thruster affects only GO that belong to the following layer. When a collider is found it can apply a 'trigger' on it. See the Unity docs for more details. The affected sphere radius, this object's area of effect. It does NOT scale with the GO transform. If true the force applied will be ForceMode.Acceleration, otherwise ForceMode.Force. The maximum amount of colliders allowed to interact each fixed frame. The rest will be ignored. You can control the applied force strength based on the distance from the thruster. For more info see ForceAppliedTypeRange. The strength of the force applied to the objects, is multiplied by the throttle. Do you want the affected GO to be pulled or pushed? For more info see ForceAppliedTypeDirection.